As the subsea industry evolves to help meet the demands of oil field operators, there is now a greater requirement for groundbreaking sealing technology. Oil and gas exploration continues its move to greater subsea depths and this has put an increased emphasis on enhanced oil recovery (EOR) processes to extend global oil reserves. It is a high priority for oil and gas operators to achieve the greatest yield from these wells. Unconventional wells are essentially any reservoir that requires special recovery operations outside the traditional operating practices. In the past, these wells were thought to be too deep for existing technology. However, this is more frequently undertaken and the associated subsea intervention needs to be more sophisticated than previous attempts. Processing technology must be able to withstand high fluid pressures while subjected to very high pressure/high temperature (HP/HT) conditions. Typical subsea operating temperatures of up to 120 C/248 F often increase in unconventional wells to more than 200 C/392 F in deep reservoirs. Typical pressures have on occasion trebled from a previous standard of 69 megapascal pressure units (MPa)/ 10,000 pounds per square inch (psi) to 207 MPa/ 30,000 psi. Seals are critical elements within oil and gas systems, as they ensure oil field equipment is working to its optimum capacity. Sealing systems are the primary barrier to preventing any fluid loss or system fluid contamination from external sources. This is especially true for valves and downhole drilling, completion and intervention tools. When working in the subsea environment, the seal function becomes more significant. Subsea seals are the principal components preventing hydrocarbon leakage from oil field completion or production equipment into the ocean. They perform a vital role in meeting environmental concerns and ensure workforce safety compliance while enhancing performance of the tools. 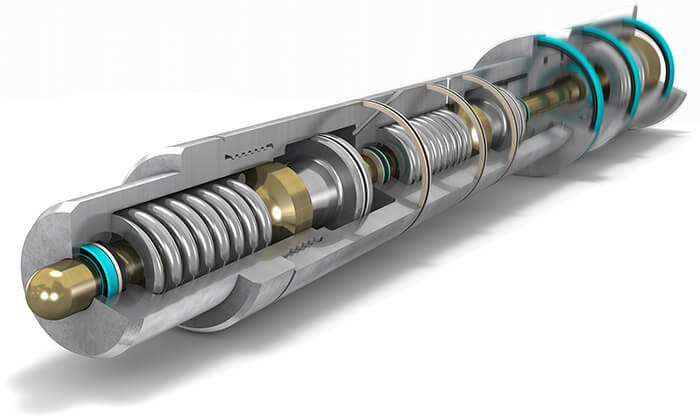 Not all standard sealing solutions and materials withstand the extreme operating temperatures and pressures of drilling in greater water depths and reaching deeper into the reserves. Therefore, specialized solutions in both material and seal profile technology are required for the industry to start exploring unconventional wells. New material and product solutions have come onto the market that focus on specific oil and gas issues such as rapid gas decompression (RGD). This phenomenon occurs when an elastomer has been subject to high pressures for a sustained period of time, driving gas deep into the structure of the polymer. If the system pressure is then quickly released, this trapped gas can expand significantly before it has a chance to escape from the material matrix, potentially damaging elastomer seals by ripping them apart from the inside. Special compounds from hydrogenated nitrile butadiene rubber (HNBR) to fluoroelastomer (FKM) to tetrafluoroethlyne/propylene copolymer and perfluoroelastomer (FFKM) are available for RGD resistance. These newly produced elastomer materials feature low compression set characteristics. This material property is particularly relevant to EOR applications, where seals may be required to function for much longer durations than in traditional interventions, while at the same time managing HP/HT conditions. The ability of the elastomer to resist compression set and maintain a large degree of the latent internal sealing forces is critical to ensuring that the seal continues to function correctly across the range of energizing pressures for extended tool operating lifetimes. Specifically engineered for the offshore and subsea industry, the materials match up to the most demanding of upstream requirements and are suited for challenging EOR systems. While recognizing the traditional standards used in the industry, such as American Petroleum Institute (API) 6A, International Organization for Standardization (ISO) 23936, Norsok M710 etc., and having a portfolio of materials that satisfy these specific applications sometimes requires materials that go beyond the traditional standards. These are particularly prevalent when dealing with unconventional wells and often require tailored materials. Applications may have exceptionally high methane content in the well or a focus on compression set properties at high temperatures for long endurance capability. Some specialist HNBR materials exhibit low temperature sealing performance, making them suitable for use within high pressure/low temperature applications. These materials can be ideal where equipment is stored topside in cold climates and then sent downhole, where pressures rise quickly but the equipment temperature increase lags behind. The influence of pressure on the glass transition/cold temperature flexibility of an elastomer can have serious consequences to the performance of seals in such applications. Furthermore, HNBR materials exhibit superior low compression set performance and high temperature sealing capability, making them suitable for operating with extended lifetimes in aggressive well environments. Additionally, high mechanical strength HNBR grades provide outstanding wear and abrasion capabilities, yielding positive results for use in dynamic applications while under higher pressure and temperature conditions. Image 2. Seals are critical elements within oil and gas systems. Specialist FKM materials have also been developed that exhibit superior methanol resistance and optimal chemical resistance for enhanced oil recovery (EOR) applications. Industry standards require testing to certain levels of methanol concentration and temperature, for example. However, in high methanol applications, the actual well conditions present differently from the industry standard. For such wells, it means that the materials, even though they meet standards, would not necessarily achieve performance criteria. While oil and gas applications face increasingly critical challenges, the upside is that equipment manufacturers serving them are developing new technologies—from the use of seismic imaging systems to see below the seabed to the development of subsea robots working underwater to 10,000 foot depths. Sealing material developers are following suit by developing advanced sealing materials and profiles to handle the most extreme of temperatures, the highest of pressures and prolonged exposure to the most aggressive of fluids. Read more issues of Sealing Sense by clicking here. Andrew Longdon is the technical manager for Trelleborg Sealing Solutions, supporting the oil and gas segment. He has a bachelor’s degree in mechanical engineering from Brunel University, West London. He may be reached at andrew.longdon@trelleborg.com. For more information, visit www.tss.trelleborg.com.